Red Sparrow, Black Widow, tomayto tomahto, potayto potahto. 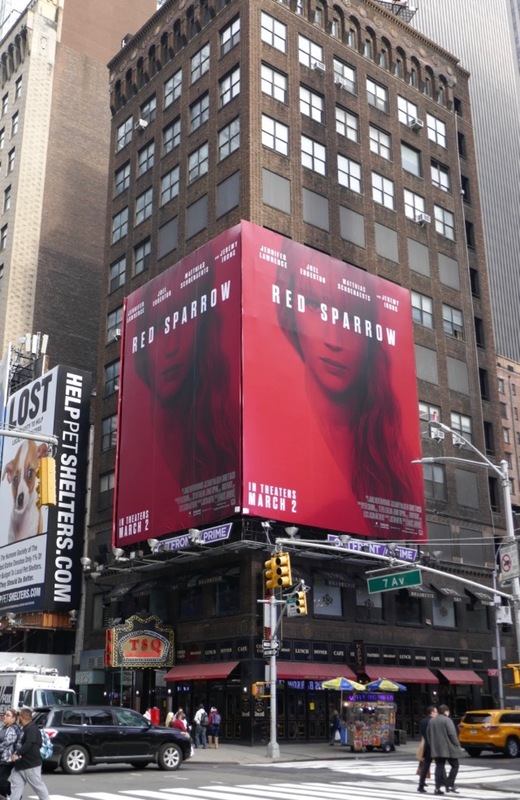 There's something incredibly familiar about Jennifer Lawrence's new spy thriller about a Russian program to seduce and infiltrate foreign targets and men of power. 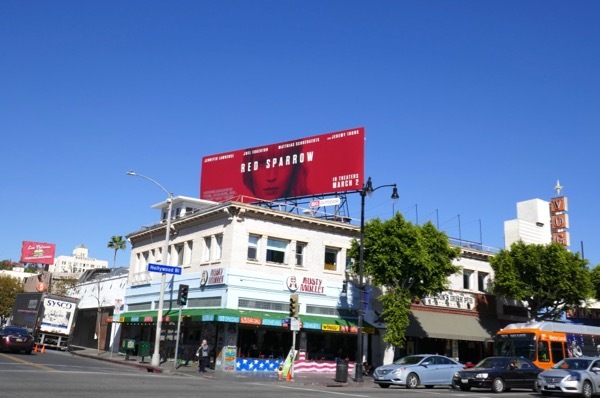 Fortunately there's something extremely intoxicating about the extremely talented actress that attracts even the most jaded cinema goer. 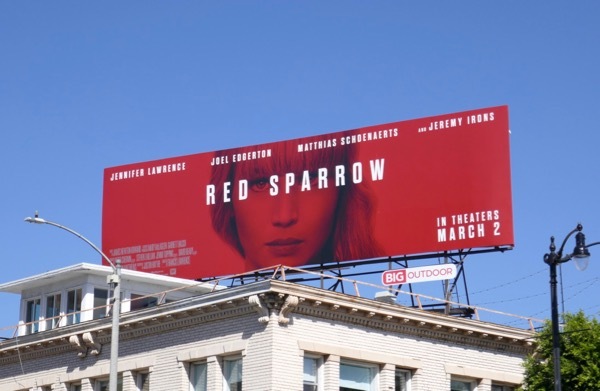 The film is based on Jason Matthews 2013 book of the same name and sees ballerina 'Dominika Egorova' recruited to 'Sparrow School' where women are trained to use their bodies as a weapon. On a mission she falls for Joel Edgerton's CIA officer and considers becoming a double agent. 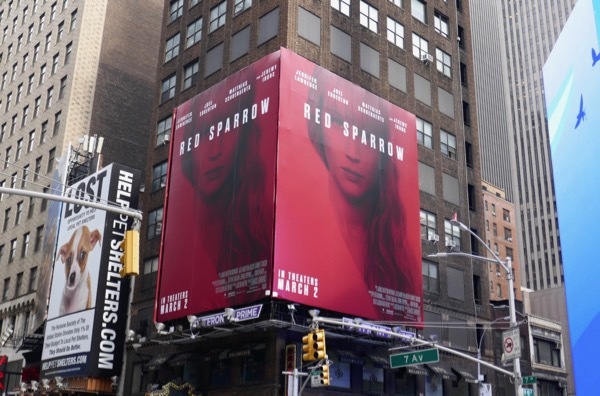 The duo of portrait billboards were spied along 7th Avenue at 49th Street in Manhattan on February 15, whilst the landscape billboards were snapped above Hollywood Boulevard and along Pico Boulevard in L.A. on February 21, 2018. 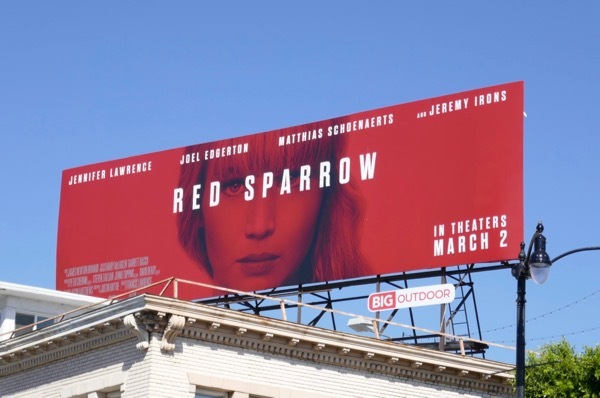 Meanwhile fans of Jennifer Lawrence can also check out these Joy movie billboards, these Passengers movie billboards, these American Hustle movie billboards and these billboards for The Hunger Games. 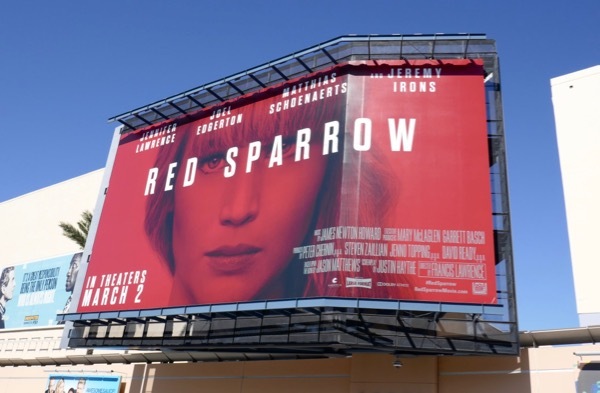 Only time will tell whether this espionage movie will come home to roost at the box office this weekend, or if Black Panther will continue to raid the nests of these big screen newcomers.